Meet PomPom. He’s pink, furry and has big feet. Take a walk on the wild side with him, during this entertaining pedi. Don’t be afraid. It’s true that this monster can be a bit naughty at times, but for the most part he’s friendly. 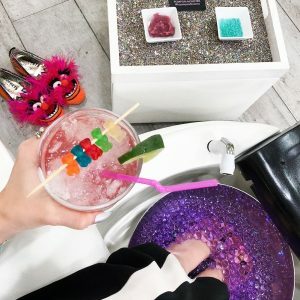 Your pedicure bowl will be filled with magical gel-filled balls which are squishy and fun to play with. His mood changes frequently, so the color of the balls will be different from one pedicure to the next. You might get black, blue, bright pink, purple, turquoise or a mix of colors. Next, a signature pedicure will be given. We paint on a super hydrating monster mud mask. This luxurious foot mask is infused with the highest quality ingredients- it will revitalize, energize and soften tired feet. Feet are then wrapped in cotton botties and placed in oversized comfy monster feet (its selfie time!). We finish with a sparkling foot massage to improve circulation and help you chill. Traces of PomPom sparkles can be left on legs and feet, or removed with a hot towel. If you are a fan of our Mermaid pedicure, you will love PomPom! Please note: We pre-make our pompom beads a week in advance, so it is not possible to request a color. We love to surprise you!